The United Nations Food and Agriculture Organization (FAO) says giving women the same access as men to agricultural resources could increase production on women’s farms in less developed countries by 20 to 30 percent. This could raise total agricultural production in underdeveloped countries by 2.5 to 4 percent and alleviate the hunger of 100 to 150 million people. One-third of our participant families are headed by females. With your help, we’ll keep increasing that number, doing our part to support the Sustainable Development Goals. Because of supporters like you, Josefa and her family now grow their own food supply, using regenerative farming methods that nourish people and the planet. “¿Amor?” 68-year-old Josefa calls to her granddaughter, Minely, from her open-air kitchen. Josefa’s worn and capable hands shape tortilla after tortilla, cooked over an open flame. How many tortillas has she made in her lifetime? Thousands. She hardly has to watch what she’s doing; the muscle memory is strong. Wisps of smoke rise through the holes in the soot-blackened thatched roof. Want to hear some of Josefa's favorite music? We highly suggest letting this old ranchera play in the background while you read. Josefa wipes sweat from the corners of her smiling eyes with the back of her hand. She peeks out and watches Minely fearlessly riding her bike about the dirt yard, occasionally falling. Minely, age 4, is oblivious to the concerns that sometimes keep Josefa awake at night. Minely throws her bike down and comes running with a grin. Their dog barks at a slow-moving truck, selling fresh fish caught in the nearby lagoon. A ranchera plays on the battery-operated radio deep inside the house. Young Minely is just one of the eleven people who live in Josefa’s household. Eleven mouths to feed. Eleven hearts and minds to nourish. Josefa is investing in a better future for her family, including for her grandchildren Jeymar (left) and Minely (right). Though life in Chunox may seem idyllic to some (birds chirping in the morning, exuberant kids playing marbles on the quiet dirt roads, no one walking around with their eyes stuck to their cell phones), it’s getting harder and harder to make a living here. The conventional sugarcane industry, where many have made their living, is crumbling. Due to overfishing, the daily catch is no longer as lucrative as it once was. No doubt about it, life in Chunox is tough. For Josefa, adversity is nothing new. At age five, Josefa’s father died, leaving her mother to raise their six children alone. When her mother fell ill, Josefa was forced to leave school to take care of her. After third grade, she never went back. She speaks Mayan, Spanish, and some English, but she never learned to read or write. Though Josefa was twice married to capable, loving men, she’s also twice widowed, both of her husbands having succumbed to sickness. Now she has eight grown children, many of whom have children of their own. While Josefa has been able to support her family, it hasn’t come easily. While Josefa’s mind may be at peace when a ranchera comes drifting through in the afternoon breeze or when she’s meditatively making corn tortillas so that all eleven members of her household have something to eat, these moments are fleeting. Before long, concerns about how to sustain herself and her family creep back in. Josefa seeks permanent solutions to food insecurity and poverty, not just temporary answers. Despite these hardships, Josefa’s home has remained an atmospheric place full of joy and mirth. Hugs and laughter are available in mass quantities. Good quality food, however, is not always as abundant. SUGARCANE, RICE, AND EVERYTHING NICE? As a youth, Josefa worked alongside her mother in the family vegetable garden. After her father died, she joined her mother working in the nearby commercial sugarcane fields, “cutting cane.” Traditionally, females don’t do this backbreaking work but Josefa says that given her family’s plight, no one ever gave them any trouble. Sugar accounts for 60% of Belize’s exports. Currently, it’s cultivated on between 23,100 to 26,300 hectares of land in northern Belize. It’s rare to find a family in northern Belize that hasn’t made a living off of sugarcane in one form or another. But there’s a difference between making a living and getting ahead. In addition to cutting cane, Josefa and her mother sometimes planted and harvested other farmers' rice. (Side note: to this day, Josefa doesn’t like rice!) At times, their work included harvesting beans for the Mennonites in nearby Little Belize. Just 19 miles from Chunox, Little Belize is home to a large agricultural Mennonite community (population 2,650) that settled in this area in the late 1950s from Mexico. Though Mennonites are well known for non-mechanized farming, many Belizean Mennonites tend to practice large-scale conventional agriculture. Between the expansion of Mennonites agriculture and the sugarcane industry, vast tracts of lush tropical forest continue to be turned into monoculture plantations. These monoculture plantations, maintained with toxic synthetic fertilizer and pesticides, are slowly encroaching on the still-green oasis of Chunox. Between 1990 and 2010, Belize lost 476,913 acres of forest cover. An average of 23,845 acres of forest cover is lost in Belize every year. An aerial view of Chunox and the surrounding area show massive deforestation encroaching. Deforestation is one of the leading causes of climate change. Image courtesy of Google Earth. Back to Josefa! Josefa’s first husband was a farmer. They lived together in Chunox, which at that time was mostly forest. Jaguars were not uncommon. Together, they grew coconuts, mangoes, oranges, plums, squash, sweet potatoes, and tamarind. Being on the coast, Chunox has been hit with many hurricanes over the years. Hurricane Mitch destroyed all their tamarind trees and many of their crops. After the loss of her first husband to a stomach tumor and her second husband to cancer and diabetes, Josefa decided to look elsewhere to make a living. She grows achiote, the plant from which red annatto seeds are derived, used for color and flavor in a number of Mayan-inspired Belizean dishes. She works on other people’s farms. She bakes and sells bread. She sells a chicken here and there. Every day, Josefa pieces together a living for her family however she can. The days are punctuated with laughter but the eternal struggle to make ends meet can be exhausting. Josefa (R) had to leave school after third grade to help her widowed mother. She hopes that her granddaughter, Kathia (L), who is now in elementary school, will have more access to education than she did. Of Josefa’s eight children, just one, her eldest daughter, finished high school. Extremely smart and motivated, her daughter wasn’t able to continue pursuing her studies after graduating from high school, due to their family’s financial struggles. One of her sons finished his sophomore year of high school, but he too wasn’t able to continue due to lack of funds. It costs about $300 a year for a student to attend high school. Given the average income for most families in Chunox, the dream of attending even high school—high school—is out of reach. Just imagine that for a moment. In early 2017, thirty families in Chunox began working with us, including Josefa’s. 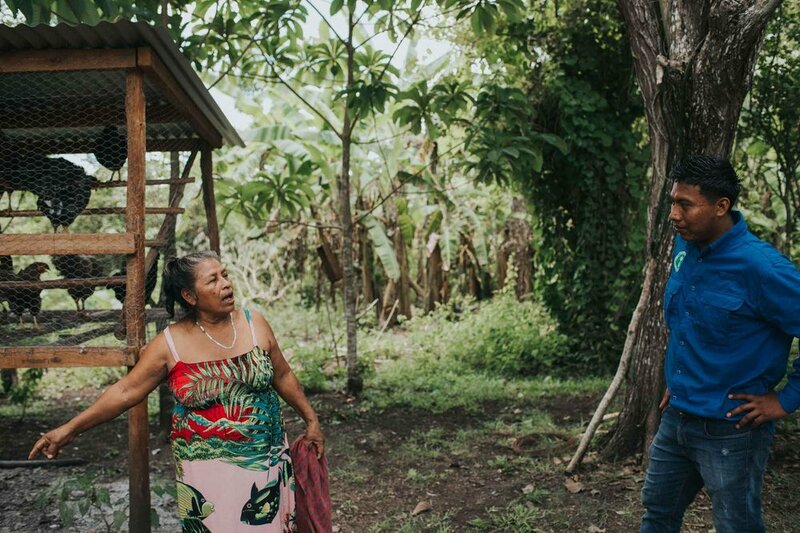 When Misael Perez, a Sustainable Harvest International field trainer, first started coming to visit Josefa and the other interested families in Chunox, she would gently tease him. “When are we going to build my wood-conserving stove, Misael? When are we going to get started on my vegetable garden, huh?” Convinced that these projects would pay off, Josefa was eager to get started right away. In less than a year, Josefa has already completed a number of projects with Misael, who visits her weekly. Josefa’s zeal is what made her one of the first participants in Chunox, to build an improved chicken coop. While Josefa had chickens previously, her traditional coop was in a state of disrepair. Her new coop makes it easier to collect the eggs and the manure, which will be used to fertilize her new garden; a technique promoted by Sustainable Harvest International that Josefa had never tried before. As her oldest daughter notes, they used to just throw the manure away. Not anymore! Eggs provide a consistent source of protein for Josefa’s family. Though eggs are available for purchase in Chunox ($2/dozen), they come from the nearby Mennonite community. Chunox locals say the yolks pale yellow and runny, in contrast to the bright golden yellow of organic free-range eggs. Many are skeptical about ingesting any hormones and antibiotics that may have been given to the chickens. Josefa’s improved chicken coop gives her the freedom to feed her family as she chooses. 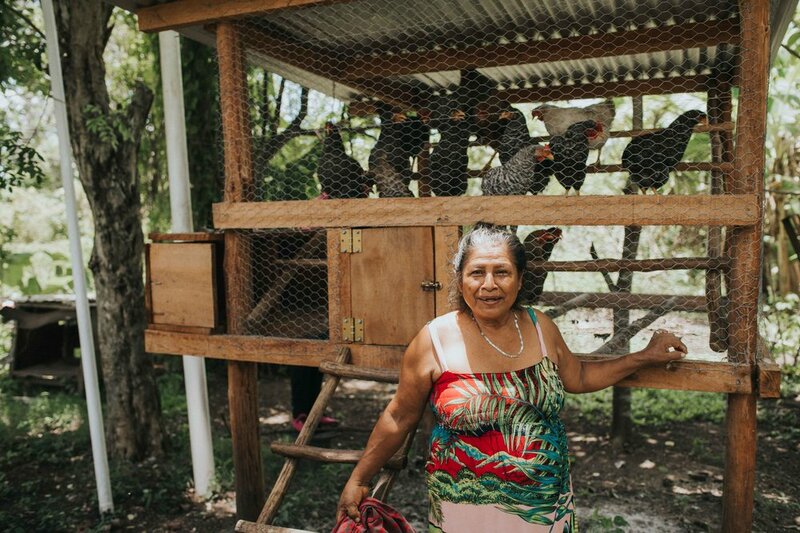 The chicken coop was just the beginning of Josefa’s relationship with Sustainable Harvest International. Soon after the coop was built, Misael helped Josefa plant 50 plantains and 50 cocoyams on her land. Then came the beautiful wood-conserving stove in her kitchen. This new wood-conserving stove reduces the amount of wood Josefa uses by 58%, freeing up time that she would typically spend collecting firewood. In addition, Josefa's previous, traditional wood stove emitted 810% more harmful carbon monoxide fumes. For those suffering from asthma, a wood-conserving stove can mean freedom from otherwise persistent wheezing. Almost every one of the 2,500 wood-conserving stoves we've built has been white. Not Josefa's; her stove is a brilliant turquoise. While painting a stove turquoise rather than white may seem like a small detail, it illustrates something much larger. Your support enables Josefa and her family to make their own decisions about their livelihood. Whether it’s the color of a woodstove or the crops they plant in their gardens, empowering farmers to choose what they want to do, when, and how, is powerful. Of all the projects Josefa and her family have worked on with us so far, their organic, regenerative kitchen garden is by far their favorite. A simple drip irrigation system ensures there’s water for the crops year-round. It provides the family with a stable source of fresh produce that isn’t otherwise available in Chunox. Most of the small stores in Chunox carry conventionally-grown, non-organic cabbage, potatoes, carrots, and onions—that’s it. Josefa’s organic garden is already bursting with floral coriander, crunchy cucumbers, and crisp lettuce. Josefa’s regenerative, organic garden is already bursting with floral coriander, crunchy cucumbers, and crisp lettuce. Her granddaughter, Minely, is in charge of watering the garden. The younger grandchildren enjoy weeding. The garden provides an opportunity for Josefa to teach the next generations how to care for both people and the planet. Josefa’s Mayan ancestors had a similar relationship to the land. Just a few miles from Chunox, Cerros, a Mayan ruin with evidence of sustainable agricultural practices still stands. In fact, many of the techniques Josefa now practices bring her closer to her ancestors than ever before. For Josefa, utilizing regenerative farming skills gives her the freedom to feed her family however she chooses (for Josefa, that means incorporating as many organic fruits and vegetables into meals as she can). Eventually, she’ll turn this labor into modest profits that she can use however she likes. Josefa says she’ll likely focus on maintaining her crowded home and educating her beloved family. Participating in our program means that Josefa, who has spent her life making sacrifices to support her family, can finally breathe a deep sigh of relief. We’re raising money to support farmers like Josefa in Belize and across Central America. Can you help? Sign up for our mailing list to follow Josefa's story and hear more stories from her neighbors in Chunox, Belize, one of our newest communities! Thank you! You'll be hearing from us shortly (check your inbox). Older PostSalvation Is In Soil - Florence Reed live at TEDxDirigo!